In the second and final part of this interview series with Russian poker pro Antoly Filatov the youngester talks about how he became a poker player. Filatov also goes into details about coaching, staking, the Russian playing style and his huge second place finish during the EPT Vienna High Roller. While studying in Moscow Filatov came in touch with poker, and his story is similar to that of many that became professionals over the years. “I built my bankroll up to $300 and that’s when I started playing some cash games on the side. A friend of mine from the University campus showed me some CardRunners videos of Cole South playing NL $5k heads up and I remember being very impressed by that. We looked for more videos and found the World Series of Poker episodes. That became my dream, after watching those videos, to play in the $10,000 World Series of Poker tournament. Now I’ve played the WSOP Main Event four times and I’ve had such bad results in Las Vegas every time. I only have one cash in total,” Filatov laughed, who’s been very successful online and on the European Poker Tour. “In multi table tournaments online I managed to win some money and I ran up my bankroll to around $2,000. That was huge for me, and then I won a $10 tournament for $5,000. The feeling I got after winning that event were impossible to describe, it was the best feeling in the world,” Filatov said, recalling his early success. “It was so much money for me, I couldn’t sleep after it. Unfortunately I lost all of that money quickly playing $100 6-max SNGs. I played a 24-hour session and lost $4,000 because I was running bad and tilting. That was the first time I lost a lot, and that’s when I decided go back and focus on multi table tournaments. I discovered the GypsyTeam.ru website, kept watching videos on PokerStrategy and CardRunners and played a lot of poker. At that time, about six years ago, nobody in Russia really knew a lot about poker. We were a step behind, definitely if you compare it to right now. Within one year I managed to create a big bankroll and I ended up fulfilling my dream of going to the World Series of Poker and playing in 25 events,” Filatov said, as he was just 21 years old when he went to Las Vegas for the first time. While his results in Las Vegas haven’t been great he feels confident, and will keep coming back, and eventually have a breakthrough result in the United States. While poker has become a much more widely accepted hobby over the years, it is still something that can create friction with parents who look for their child to find a long lasting stable career. This wasn’t the case for Filatov however, as he had full support right from the start. “I also think poker was never a problem for me because my parents knew that I was going to be smart about it. They have always believed in my abilities and decision making,” Filatov added. While many students drop out of college, or choose to not even attend one due to poker, this was also not the case for Filatov. Despite not being too happy with the choice of his education he managed to finish, and perhaps use some of his skills later in life. In his poker life Filatov looks to educate less skillful players and while he hasn’t found many students just yet, he looks to expand his business in the future. “I always host live streams when I’m playing because I enjoy doing them and it helps me have more fun. Besides playing myself I also do a lot of coaching, which allows me to make some extra money, but it’s also fun to do. My pricing has increased because of my results, so right now I’m charging $250 to $300 per hour,” Filatov said, as a poker player’s hourly rate is based on what he can make if he were playing himself. “Right now I’m coaching one guy from the Ukraine who’s also buying some pieces of me when I play in high rollers. In the near future I would like to expand my coaching operation and get some more guys on board,” Filatov said. The results Filatov’s had over the years permit him to play in the biggest events, but he’s still smart with his investments. “When I want to go to a live event I will try to win a package on PokerStars. For instance, with the WSOP, I just go there and sell some action if I need to. The staking and backing community in Russia is very similar to how things are going in the US. Someone like Max Katz was one of the first to be very successful with his fund, and a lot of people look at that for a way to also make money staking. Katz’s fund had pieces of Pius Heinz when he won the WSOP Main Event, David Vamplew when he won EPT London and Galen Hall when he won the PCA. The traveling part of the Russian-speaking poker community always makes sure to seek each other out. This group keeps growing and Filatov gives us his thoughts on who we need to keep an eye on. “If a Russian player makes the final table of an international tournament we will all come to support. It’s important to support your colleagues and the Russian poker community is a pretty close knit one. We always go out to dinner with groups and I think that all the professional players know each other,” Filatov said. “There are a lot of very strong players right now in the Russian speaking poker community and I think that Artem Vezhenkov is one of the best MTT players. He doesn’t play a lot live, but mostly online as ‘veaaa’. Roman Romanovski, and Artem Metalidi from the Ukraine are also among the best and there are some Belarusian guys like Vasili Firsau, Igor Soika, Anton Astapov, Kyrill Radionov and Vadim Kursevich. But also Russians like Max Lykov, Roman Korenev, Ivan Soshnikov, Dmitry Yurasov, Alex Kravchenko, Vitaly Lunkin and Ivan Demidov are still doing very well. Besides these guys there are also a lot of young guys that are up and coming. When asked how to characterize the Russian playing style, Filatov responds as following. “When Russians start to bluff, they can’t stop. Daniel Negreanu said one time that if Russians didn’t bluff so much they would win every tournament. We just love to bluff, and show the biggest bluffs, because that’s our reason for liking poker. I’m not sure why that is, but it’s probably part of the Russian character, and perhaps a little bit of ego. We always try to break the rules and do something crazy,” Filatov said. “If you look at it like that I’m not really a Russian, because I don’t drink alcohol and I never smoke. A lot of players do all that, so I’m maybe a little bit boring if you want to go out and party. I think most Russians drink like they bluff, which is a lot. They like drinking in groups especially, but that's not for me since I’m married!" During EPT Vienna Filatov was on the cusp of a breakthrough final table run, but from the moment he grabbed the chip lead on Day 4, he did not manage to win many pots. We assumed this might’ve been because of the ‘Crazy Russian’ inside of him, but his explanation was much simpler than that. “I was frustrated after getting knocked out, but I still felt confident in my game. Sometimes you just get into that situation where it feels like you can see the cards of your opponents, and you know what they are going to turn over. Because of this confidence, I decided to play the high roller as well. Before I registered for the high roller my wife was talking to my mom on the phone and she asked if there were any tournaments that I could play after the Main Event. She said that there were, and she responded by saying that I should play. So when I was talking to my wife she said, ‘Your mom told me you should play the high roller,’ and I did. The EPT High Rollers usually draw a very tough crowd, but Filatov thinks that he has already reached a level that exceeds that of those events. “I feel like I have an edge in the high roller tournaments. The high roller fields are very specific, as there are businessmen who are not that good and also top pros that are very good. In Vienna there were also some weaker regulars and because my online win rate is good at the higher stakes, I feel very comfortable in these types of tournaments. During the tournament in Vienna I was very fortunate to have good table draws, compared to Prague where I sat with just regulars the entire time. Even in Prague though I finished with 150,000 after Day 1, but then on Day 2 I ran ace-king into Olivier Busquet’s kings. 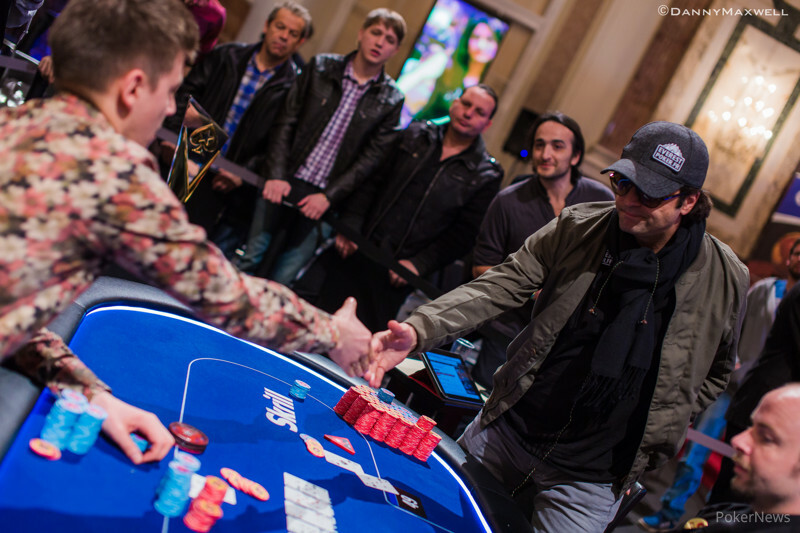 Vienna was just my second ever high roller tournament on the EPT and only my third Main Event,” Filatov said looking back on the most recent EPT season. Filatov’s summer has been rather quiet and with EPT Barcelona about to kick off it speaks for itself that this talented player will again try show his skills on the felt. The competition at the highest stakes is better than it has ever been, and this trend shows no signs of turning around. In order to be a successful professional in 2014 you have to put it all on the line, day in and day out. Only time will tell if Filatov has what it takes to constantly battle with the best, but at least he’s not lacking confidence. “From now on I would like to be at every major tournament,” Filatov closes out with, because there’s no doubt in his mind that he will get where he wants to go. You can follow Anatoly on Twitter and Instagram where he posts lots of things about his life as a world-traveling poker professional.